If you are still hesitating, you can try the online demo, get a look at the most popular questions or ask for details on the official Ultimate Terrains thread on Unity’s forum. Installing Ultimate Terrains is a very simple process. Ultimate Terrains is fully compatible with Unity 5.6.x and Unity 2017.x, however it is strongly recommended to use Unity 2018 as it will run approximately 2 times faster with it. So if you can update your Unity version, do it! Just download and import Ultimate Terrains into your project like any other asset. All files are mandatory so please import everything. To complete the installation you may need to restart Unity in order to get the new menu under Tools > uTerrains. That’s all! If you get any error at this point, try to re-import Ultimate Terrains in a blank project, so you can check if the problem comes from your project or not. In particular, if you are updating an existing project, you should remove the uTerrains folder before importing the new version (be careful to not lose your own scripts if you do so!). You shouldn’t get any conflict with other assets, but if you do please let us know. Unity 2018 or more recent version is highly recommended to get the most out of Ultimate Terrains. Installation is still very simple, but you’ll have to do a small configuration change in your project settings (recommended, not mandatory). Before importing Ultimate Terrains into your project, set the Scripting Runtime Version to .NET 4.x Equivalent in Player Settings. Go to Player Settings (Edit > Project Settings > Player) and select .NET 4.x Equivalent as Scripting Runtime Version. Once this is done, download and import Ultimate Terrains into your project like any other asset. All files are mandatory so please import everything. Before starting, just a word to say that you can get more explaination on almost all parameters in Ultimate Terrains just by hovering (wait 2s and it will display help). This is very useful to get more information about a field without having to go to the documentation all the time. If you want to see directly what kind of things uTerrains can do, you can open the provided example scenes and just press ‘Play’. You can use these scene to get an idea of how to setup a terrain, but I strongly recommand that you actually setup a scene from scratch so you will understand what’s going on and what parameters stand for what. Everything has been made so you can start using Ultimate Terrains in a few minutes only. However, you will need some time to understand all parameters and to learn how to create the terrain you want. Let’s start with a blank, new scene. Please, create a new scene (File > New scene). Then just add a player to your scene. You can drag & drop the FreeFlyPlayer prefab from uTerrains/Scenes/Misc folder (don’t forget to remove the default scene camera if you do so). If you use your own prefab, just be sure to disable gravity (or to add a plateform below it) otherwise your player will fall while the terrain has not been generated yet. We’ll see later how we can prevent this. Add a new ultimate terrain to your scene: in the top menu of Unity, click on Tools > uTerrains > Add terrain. This will open a window where you can change the base settings of the new terrain. Don’t worry, you will be able to change any of these settings later in the ultimate terrain inspector. Drag & drop your player object (this can be the camera) into the Player Object field. Drag & drop the material you want to use in the Main Material field. You can use the included materials under Assets/uTerrains/Materials/Terrain. You should now see a new object (named ‘uTerrain’ by default) in your scene. Select it to display the terrain inspector. Before going further, you have to define a layer for chunks. You’ll find a parameter named “Chunks layer” at the bottom of the ‘Global Settings’ tab of the inspector GUI. Please create a new layer and select it. Your terrain has now its minimal setup, but it cannot run yet, because you didn’t tell it what to generate. We’ll see parameters of the Global Settings tab in details later. For now, just leave them as-is and go to Voxel Types tab. you’ve selected a few minutes ago in the Create Terrain window. Just below, you can add one or more Grass Materials. As you can imagine, they are the materials that will be used for grass. We’ll leave it empty for now. match the different textures of your terrain. a Name which must be unique. This parameter is important as it will allow you to reference it in biomes (that we’ll cover after). a Material Index corresponding to the index of the material to be used by voxels of this type. Remeber the Materials you added right before? This is about it. a Priority which must be unique. In case there are several candidates for a voxel, the one with highest priority will be chosen over the others. the Blockiness which determines if voxel of this type will look more or less cubical. the VoxelTypeFunction which is a script that determines the color of vertices generated by voxels of this type. The default one simply returns a predetermined color that you have to specify in the ‘Vertex Color’ field right below. then, you can choose to enable/disable grass on this type of voxels. For now, we’ll leave it disabled. finally, once you will have defined some details and trees (we’ll see it later), you’ll be able to choose which details & trees can be spawned on this type of voxels. Your terrain should already have one voxel type that has been created for you. Change its name (let’s say, ‘myVoxelType’) and leave the other values as-is. You can add as many voxel types as you want, but for now, one is enough. Move now to the Biomes tab. This is where you define how your terrain gets generated. Ultimate Terrains can handle multiple biomes on a single terrain. For now, we’ll just create a simple terrain with only one biome. The first field you have to fill in this tab is the ‘Biome Selector Script’. You can notice there is an error displayed in the inspector (just below this field) that tells you no script has been selected yet. The terrain cannot even start without it. As its name suggests, a Biome Selector Script tells Ultimate Terrains what biome should be used at a given world position. By using some noise functions (such as Perlin), altitude, or whatever you’d like, you can spread biomes procedurally. A very common example is to select biomes based on the altitude, like having one under-water biome and one land biome. Anyway, for now as we said, we just want a single biome. Click on the field to select a script and search for ‘UniqueBiomeSelectorSerializable’. Choose it. You may have noticed there is a ‘UniqueBiomeSelector’ script and a ‘UniqueBiomeSelectorSerializable’ script. The first one is the actual implementation (doing the job at runtime) while the second one is in charge of displaying the editor GUI proper to this script (if any) and save its fields value. This is why in the editor you will always choose the scripts that end with ‘Serializable’. The UniqueBiomeSelector is the most simple selector you can imagine: it always returns the first biome defined on your terrain. It doesn’t have any parameter. All right, you are now ready to create your first biome. One biome as already been added by default, but it has no name yet. Give it a name. Note: you can click on the ‘Add biome’ button to add more biomes to your terrain, but we don’t cover multiple biomes here. Then, click on ‘Open Biomes Module Editor’. This opens a new windows that probably raises some questions and needs some explanation! Before going further, please resize the window so you can view the whole picture. It is important to understand this graph represents the workflow of voxel generation. the 2D position is the input of 2D values generators (if any) in the 2D Master node. For example, this can be 2D Perlin noise like Perlin(x, z). 2D values generators are commonly used to create the ground of a classical height-based terrain (mountains, etc.). the 3D position is the input of 3D values generators (if any) in the 3D Master node. For example, this can be 3D Perlin noise like Perlin(x, y, z). 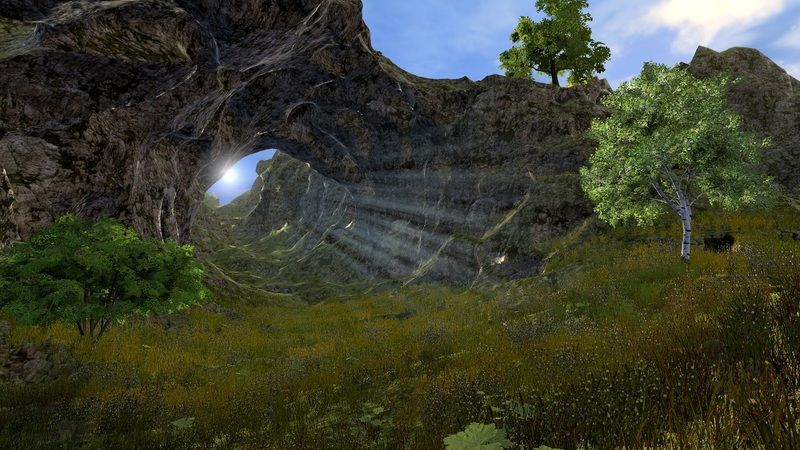 3D values generators can be used to create caves, overhangs or floating islands for example. all values generated by 2D & 3D generators, as well as the voxel 3D position, are the input of the ‘Ultimate Combiner’ which uses all these values to finally set the definitive voxel value and type (you know, the voxel type we talked before). as a result, a voxel gets generated. Ultimate Terrains comes with some 2D generators, 3D generators and Combiners so you can generate your terrain without the need to implement them by yourself. However, note that you have the possibility to implement your own ones. This makes Ultimate Terrains highly extensible and extremely powerful. Let’s setup a minimalistic biome. 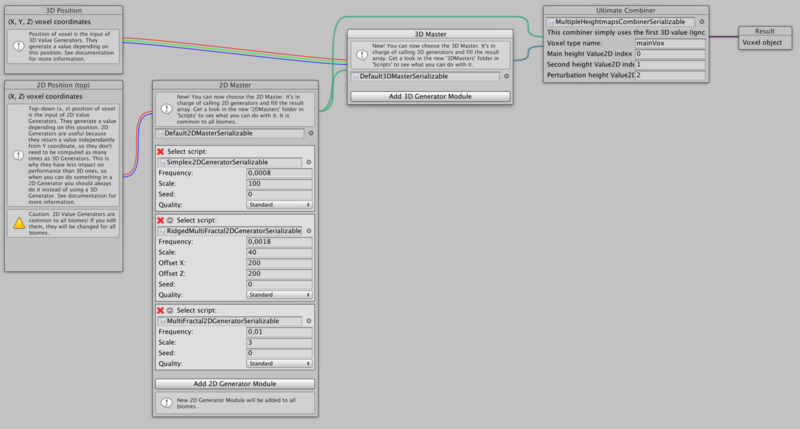 In the ‘2D Master’ node, click the field to select a 2D master script (see here for more info). Select ‘Default2DMasterSerializable’. Click on ‘Add 2D generator module’ just below. Then, select ‘HeterogeneousMultiFractal2DGeneratorSerializable’. For frequency, set 0.001 and for scale, set 80. In the ‘3D Master’ node, click the field to select a 3D master script (see here for more info). Select ‘Default3DMasterSerializable’. In the ‘Ultimate Combiner’ node, click the field to select a Combiner script (see here for more info). Select ‘BasicHeightmapCombinerSerializable’. In the voxel type name field, write the name of the voxel type you added previously (that should be ‘myVoxelType’). Save your scene (Ctrl+S) and close the window. Your terrain is ready to run. Press ‘Play’ and wait for the terrain to be generated. If you used FreeFlyPlayer prefab, it will probably raise an error because it is missing some setup, but you can just ignore it for now. Stop it for now. The terrain disapears. Indeed, the terrain only exists at runtime. You can also create and edit the terrain from the editor without the need to press Play. For this, go to ‘Editor Tool’ tab, click on ‘Start editing’, and wait for the terrain to be generated. Once you’re done, you can click ‘Stop’ button to stop terrain updates within the editor, and ‘Clear’ button to stop and clear the terrain (don’t worry, it will not clear its configuration). Each time you change terrain configuration, remember to Clear it, because it is not automatically updated with new parameters until you restart it. Now, clear the terrain by clicking on ‘Clear’ button and go to the Biomes tab again. Click on ‘Open Biomes Module Editor’, and change the frequency value of the 2D generator module from 0.001 to 0.005. Press Play to generate the terrain. What do you see? What did it change? The mountains and the valleys are closer to each others. Actually, the look of your terrain has completely changed, just by modifying this little parameter. See how the biome configuration is important. It is the heart of your terrain configuration. Ultimate Terrains comes with a simple but powerful grass generator. Grass is generated depending on the voxel type, which allows to add different kind of grass to different parts of your terrain and to choose where to put grass and where not to put it. Go to Voxel Types tab, scroll down to your voxel type and check the ‘Enable grass’ checkbox. New parameters appears to configure the grass. You can leave all the values as-is for now. At the top of the Voxel types tab, just below Materials, you will find Grass Materials. You need at least one grass material. Click on ‘Add grass material’ and select ‘WavingGrass01’ material. Press Play to see your terrain with grass on it. Then, Stop. Now, add a new grass material and select ‘WavingGrass02’. In your voxel type, under grass parameters, click ‘Add grass material’ and set the value of ‘Grass material index 1’ field to 1 (which is the index of the second grass material you’ve just added: WavingGrass02). Then, set the value of ‘Probality 0’ to 0.5. Press Play again. You should now see the grass is a mix of the two grass materials. This allows to add different kind of grass very easily in order to get a nice result. You have some grass, but you’d like to add some other plants or some stones or mushrooms or whatever details to your terrain. This is what details object are made for. In Ultimate Terrains, details objects are exclusively GPU instanced to avoir GameObjects overhead. Go to the ‘Scenery’ tab, and ‘Details’ sub-tab. Click on ‘Add detail group’. A details group may be a set of stones, or a set of different plants for example. As you see, you can have one or more details objects per details group. A details object is defined by a mesh and a material. You cannot put gameobjects prefabs directly. Give a name to your new details group (for example, “Stones”), and change its density to 2. Then, go to Assets/uTerrains/Scenes/Misc/Rock_Set/Rock. There are an imported rock model, its texture and its material. Unfold the model ‘Rock’ and drag & drop its mesh into the ‘Mesh 0’ field of the detail object. Same thing for the material: drag & drop the ‘RockMaterial’ to the ‘Material 0’ field of the detail object. Now you have a simple details group defined, containing a single detail object. If you press Play, you will see that nothing changed! This is because you have to enable the details group on a voxel type to see it. Go back to the ‘Voxel types’ tab, and check the checkbox called ‘Enable details ‘Stones’. Now, press Play. Thousands of little stones are spread over the ground! These stone don’t look so good, I agree, but this is just an example. It’s up to you now to use this for plants, wood sticks, mushrooms or whatever. All right, your terrain looks better and better, but it is missing one important thing: trees. Trees are spawned independently from terrain generation. Thehe job is done in parallel of terrain generation. This is very fast and does not slow done the terrain. Trees are spawned as gameobjects (not GPU instanced) so they can have colliders and so on. However, it is up to you to ensure that your trees has some LOD system. Ultimate Terrains won’t generate billboards for you as the standard Unity terrain does. This is why I recommend to use SpeedTrees: they come with LODs and colliders out of the box. Got to the ‘Scenery’ tab and ‘Trees’ sub-tab. The first parameter ‘Max LOD with trees’ controls the distance (in term of terrain LOD) at which trees will be spawned. Set this value to 4. The second parameter, ‘Max trees spawned per frame’, controls how many trees (at maximum) should be spawned per frame. 10 is generally a good value as it prevents lags. Tree density is very important as it controls the average distance between two trees. This is more the inverse of the density actually, because the bigger it is, the less trees will be spawned. Set this value to 20. Density noise controls the frequency at which the tree density varies. Indeed, trees are spread thanks to this noise to make it more realistic. Finally, ‘Trees height’ represents the average height of a tree. This setting is extremely important as Ultimate Terrains will make sure there is enough vertical space before adding a tree somewhere. Ultimate Terrains also uses this internaly as a step to find where is the surface, so the lower it is, the longer it will be to spawn trees. Avoid to set a value lower than 10. Below these settings, there is some space for Trees Groups. Trees groups are similar to details groups, except that they contains a list of gameobjects (instead of mesh/material pairs). Click now on ‘Add tree group’, give it a name and drag & drop a tree object in the ‘Tree 0’ field. You can take a tree from SpeedTree that is available in the Unity’s Environment package (menu Assets > Import package… > Environment). Like for details, you have to enable the tree group on your voxel type otherwise it won’t be used and no tree will be spawned. So go to ‘Voxel Types’ tab, and choose the tree group you’ve just created in the ‘Tree group’ dropdown of your voxel type. Press play and see the result. You might be surprised to see that trees are spawned before the terrain has finished to be generated. This is because trees system does its job independently from terrain generation. This is the end of the Getting Started tutorial. You’ve learned how to setup a basic terrain from scratch, defining a voxel type, a biome and adding some grass, details and trees to it. You may still have a lot of questions (maybe even more than before!). You can deep dive each topic by reading the rest of the documentation. The tab ‘Global Settings’ contains a lot of very important parameters that control terrain size, quality, speed and more. Let’s see what they do one by one. The first parameter is quite simple: is your terrain finite, or infinite? Finite terrains don’t have specific advantages except that in a finite terrain, chunks are never destroyed to follow the player. Depending on what you want to achieve, this may be more suitable and save a bit of computation time by increasing the chance of using cached data. This setting controls how chunks of different LODs should connect to each other. Properly connected seams creates perfect transitions but requires to compute each chunk several times (to generate LOD transition versions). Skirts just adds some triangles to chunk meshes in order to make holes invisible. It is very cheap to compute, but it creates ugly artifacts. The third choice you have is to chose both of connection modes. This is heavier in computation time, but it is the safest way to avoid any possible visible hole between chunks of different LODs. If enabled, Ultimate Terrains will duplicate each vertex so you can avoid texture stretching. This is more useful for cubical terrains. If enabled, Ultimate Terrains will compute tangents for you. This is needed by some shaders (disable it if your shader doesn’t need it). These settings are extremely important. The geometric error is related to the terrain quality. The lower it is, the better your terrain will look, but with a higher performance cost. If it’s too low, the terrain will take too much time to get generated. If it’s too high, your terrain may look ugly and even have holes! Indeed, if the acceptable geometric error is too high, terrain generation could miss some voxels which you really want to avoid. There is no geomteric error value that works all the time: it really depends on your terrain (ie. biomes settings). Max error multiplier on surface allows you to increase (or decrease) the acceptable geomteric error when surface has been detected. This is quite useful because you can lower a bit terrain quality (and save CPU) without the risk to miss voxels. Max error multiplier on chunk borders allows you to ensure chunk borders are properly computed by decreasing the acceptable error on borders. This can avoid potential and unwanted terrain holes. This is the distance at which Ultimate Terrains should consider a voxel is really close to the surface and should make a special effort to ensure the surface won’t be missed. Draw size and vertical draw size are the number of chunks of highest LOD to generate around the user. For example, if you set the draw size (and vertical draw size) to 4, Ultimate Terrains will build 4 chunks in the front, the back, the right, the left, the bottom and the top of the player (so, 8x8x8=512 chunks). So, for example, if the highest LOD is 7, the size of a chunk in Unity’s unit will be 1024x1024x1024, and consequently the size of the visible part of the terrain will be 8192x8192x8192. This defines the highest LOD to compute on the terrain. Each time you increase this by 1, you double the size of the terrain. The next parameters allow to set how many chunks of a particular LOD you want to be generate before the next LOD starts. Generally, you want it to stay small in order to improve performance. Change it only if you want higher quality at higher distance. The following parameters simply allows to create some chunks at the very begining of the game and put them in a pool to avoid creating them at runtime (making possible lags). As you can guess, these parameters controls which LODs should have cache, colliders and so on. Keep these parameters as low as you can to improve performance. A special word for ‘Max LOD with cache’: when cache is enabled on a chunk, it will be faster to recompute in case an operation (like digging) is done on it. However, it consumes a lot of memory, so keep it low. This parameter is very important as it tells where terrain data (ie. operations) is stored on the filesystem. It must be a subfolder of StreamingAssets/uTerrainsData (you have no choice on this part) to ensure it will be included in your final build. This one is self-explainatory. This is the size of one voxel. You can increase of decrease the number of threads dedicated to chunks generation. You should keep it under 3 unless you are sure the target CPU has more than 4 cores. This is the object around which the terrain will be generated. This is generally the main camera. Post-building consists in applying computed mesh to a chunk object. It updates the mesh filter, the mesh collider (is any) and a few other things that can only be done on the main thread (Unity restriction). Post-building is very fast thanks to Ultimate Terrains that pre-compute almost everything in background threads, but if too many chunks get post-builded in a single frame, this would create lag. To avoid this, you can setup the maximum time that must be spent in post-building per frame. For the same purpose, you can also limit the count of chunks to be post-builded in a single frame. Keeping a max time spent / frame below 10ms should prevent FPS from droping under 60. You have to create a specific layer for chunks and select it in the ‘Chunk layer’ dropdown. This is mandatory. You can also optionaly create a specific layer for grass. The editor tool allows to edit the terrain directly within the scene view as you would do with a standard Unity terrain. It generates the terrain in the editor and temporarly replaces the player object of the terrain by the scene view camera, so the terrain is built around the scene view camera. To begin, click on ‘Start editing’ and wait for the terrain to be generated. Then, you can select an operation (like Dig Sphere, etc. ), change its parameters (like radius, etc. ), and apply it by clicking on the terrain directly in the scene view. Once you’re done, you can click on ‘Stop editing’ (the terrain will still be visible in the scene view but won’t be updated as the scene view camera moves) or on ‘Clear’ (the terrain will be destroyed and removed from the scene but all your modifications will be saved, don’t worry). In Ultimate Terrains, terrain can be edited at runtime through what we call ‘operations’. Any action on the terrain (like digging, adding voxels, etc.) is performed via operations. You cannot edit the terrain in any other manner. Operations are the unique entry point for editing a terrain once it has been generated. Even the Ultimate Terrain Editor uses operations to alter the terrain. You can retrieve all these operations in the Ultimate Terrains Editor’s inspector. By the way, you will be able to use any custom operation from the Editor too, because it scans your project and finds all scripts that implement IOperation interface. These is one of the powerful feature of the Editor. Notice that we first create a new instance of the DigSphere operation with some parameters like the position (where we are going to dig), the radius (size of the sphere we dig) and the voxelType that will replace existing voxels (for example, a voxel type with an underground rock texture). Then, we add the operation to the list of pending operations of the Operation Manager. Finally, we call PerformAll method to perform all pending operations. The boolean parameter of PerformAll method determines if the operations should be done asynchronously or not. Here, we pass the boolean value ‘true’ to the method, meaning operation will be done asynchronously. The good point of doing it this way is that we are able to perform several operations at the same time and potentially a lot faster than if we performed operations one by one. If you decide to perform operations synchronously (passing false to PerformAll method) then they will all be done in one frame. This is a good thing when you are in the editor, but this is not ideal at runtime as it can cause lag. If you decide to perform operations asynchronously (passing true to PerformAll method) then you cannot be sure they will all be done in one frame, but you can be sure they won’t add lag, making it ideal for runtime editing. When you are performing operations asynchronously, it is very important to check if the state of the Operation Manager allows you to do that thanks to the boolean terrain.OperationsManager.IsReadyToComputeAsync. Now that you know how to use operations in your scripts, let see how to create your own custom operations. We’ve seen how operations can be used to edit the terrain, it’s time to see how to create our own custom operations. Some basic-but-very-useful operations are already included in uTerrains (in the Presets folder) such as dig/add/paint cube, sphere and cylinder, but you may want to create an operation that add a custom shape like an arch, a building, a giant mushroom or whatever you want. In order to do this, you will have to create a new operation. Programming skills are needed to achieve this. You do not need to be a C# expert, but at least you have to be able to create a class that implements an interface. If you have no idea of what is an interface, we recommend to search over the Internet, there are plenty of tutorials that explain it well. easy because everything has been made to hide to complexity (operations are actually a way to implement the visitor pattern). hard because if you do not pay attention of what your are doing you can quickly create an operation that will have horrible impacts on performance. Be careful when you write the script of your operation. Create a class that implements IOperation interface. Create a class that implements IOperationEditor interface. You must put it in Editor folder, otherwise your project won’t build anymore. Ultimate Terrains Editor will automatically add your new operation to the list of available operations, so you will be able to use it from the Editor. To see how to implement IOperation interface and IOperationEditor, get a look at DigCube.cs and DigCubeEditor.cs in the Presets folder. Those are good examples. Biomes are at the heart of terrain generation. A biome is a set of generators and combiners (see below) that is in charge of producing voxel values (output) at asked positions (input). A single terrain can have many biomes, allowing to generate completely different kind of ground & shapes on a single terrain. A typical example of it could be a “above water” biome that generates hills and valleys and an “underwater biome” that generates underwater ground with cliffs, submarine caves or whatever. There can be only one active biome at a given world position. Ultimate Terrains knows which biome to ask for voxel value at some position thanks to the Biome Selector. The role of the biome selector is simple: it tells what biome must be used for a given world position. It “selects” the right biome for the right place. There is one, and only one biome selector in a terrain. Obviously, the most simple biome selector is the UniqueBiomeSelector which always select the same biome. This is the default biome selector and this is the one that should be used when your terrain is made out of a single biome. It returns the ID of the biome that must be used at position (x,y,z) which is always 0 in the UniqueBiomeSelector. Ultimate Terrains comes with another biome selector, the AboveAndBelowBiomeSelector, which selects biomes depending on altitude (y coordinate). It is more interesting than the UniqueBiomeSelector as it actually choose between two biomes, but it remains very simple. It has two biomes ID (one for the "above" and one for the "below") and an altitude (yCoordinate) from which the biomes are choosen. As you see, if the world position is below the yCoordinate, then it returns the ID of the "below" biome, otherwise it returns the ID of the "above" biome. You should try to use this biome selector on your terrain. Go in the "Biomes" tab of the terrain inspector and change the Biome Selector script from "UniqueBiomeSelectorSerializable" to "AboveAndBelowBiomeSelectorSerializable". This will display a few more fields in the inspector allowing you to define yCoordinate, aboveBiomeId and belowBiomeId. At this point, there may be some error if you press Play because you defined only one biome on your terrain. Just create a second biome (like you did for the first one in the Getting Started section) and put different values for frenquency. Once it is done, press Play and see the result. It's quite easy to implement your own biome selector. All you need is to create a script that implements IBiomeSelector interface, and a script that extends SerializableBiomeSelector for the editor GUI. To put it simply, it must return the ID of the biome that must be used at position (x,y,z). It also provides 2D values (we'll see later what it is exactly) that can be used to select a biome. For example, these 2D values could allow you to select the biome depending on the value of some 2D Perlin noise generator. The best is to give an example. Get a look at AboveAndBelowBiomeSelector.cs and AboveAndBelowBiomeSelectorSerializable.cs to see how it is implemented. A biome is a set of generators and combiner that is in charge of generating voxels. Basically, when Ultimate Terrains generates a terrain, for each (needed) 3D world position in the space, it generates a voxel. Then it will generate the surface of the terrain from all voxels thanks to the dual contouring algorithm. To sum up, biome selector chooses which biome to use, then voxels are generated through the generation flow defined in the biome, and finally surface (ie. polygons) will be created from them. Remember a voxel has a value (which basically corresponds to the closest distance between the voxel and the surface) and a type (that will be used to determine the vertices colors, if there should be grass, or trees, etc.). Consequently, to generate a voxel, the biome must both generate a value and choose a voxel type. Let's see how it does. A biome has a some 2D value generators, a 2D master, some 3D value generators, a 3D master and a final combiner. This looks like a lot to learn, but it's actually not that difficult and fortunately, the biome editor's GUI displays all of those components in a flow chart, making it a lot easier to understand. As you see, the flow chart shows the entire process of generating a voxel, starting from a 2D (top-down) world position and a 3D world position, to go through all generators and through the final combiner, to finally get a voxel as a result. This is what we call the generation flow. Let's see each component in details. 2D Master is in charge of calling all wanted 2D value generators for a given top-down world position. Most of the time, you won't need to implement your own and you will just use the default 2DMaster implementation which simply calls all 2D value generators. In some situations, it may be benefic to implement your own 2D Master in order to call only 2D generators that will trully be needed at a given position. This can improve performance, but you should not care about this unless you are an advanced Ultimate Terrains user. This is the same as 2D Master but for 3D value generators. 2D value generators take a top-down world position as input, and returns a float value. They are common to all biomes meaning that if you change 2D generators in a biome, it will affect all other biomes. This is done this way for performance reasons, and also to allow the biome selector to use 2D generated values. To create your own 2D generator, you will have to create a class that implements the I2DGenerator interface (just like in the example above) as well as a class that extends Serializable2DGenerator for the GUI. Get a look at /Assets/uTerrains/Scripts/Generators/2DValueGenerators folder to see a list of 2D generators that you can take as examples. To create your own 3D generator, you will have to create a class that implements the I3DGenerator interface (just like in the example above) as well as a class that extends Serializable3DGenerator for the GUI. Get a look at /Assets/uTerrains/Scripts/Generators/3DValueGenerators folder to see a list of 3D generators that you can take as examples. The final combiner, is here to combine 2D and 3D values to compute the final voxel value, and choose its voxel type. There is one, and only one, final combiner per biome. A final combiner must implement the IFinalCombiner interface. /// the value and the type of the voxel at this position. As you see, the Combine method does not return anything. Instead, it uses C# out parameters so you have to assign a value to voxelValue parameter and voxelType parameter. Here is a very basic example of a final combiner that just takes the first 3D value as-is, and uses always the same voxel type. The final Combiner is the most important module of the generation flow. It is responsible for actually giving a value and a type to each voxel. If you get a result that looks blocky / not smooth enough (especially on big LODs), it's probably because voxel values are relatively too different between each others. Try to just divide the voxel values by some constant, typically 64. This may solve your issue. The first directory contains operations persisted at runtime. The second directory contains only operations that have been done at edit time and that are included in the final package of your product. If a file is found in the first directory, it won't be loaded from the second one. In other words, the runtime-directory overrides the packaged-directory. // THIS WILL NOT WORK IN AWAKE. ONLY IN START OR UPDATE. Terrains configuration is entirely saved in the scene file. No need to care about that. However, terrain modifications (ie. Operations) must be saved separatly. There are different ways to persist Operations. At edit time (ie. within Unity editor), the prefered way to save Operations is to call the Persist method of UltimateOperationsManager. This method takes a boolean as parameter that indicates if you want to completely override all data when you save. In edit mode, you'll probably want to do that most of the time. You can also specify a path (of a directory) where to write files. Unless you want to achieve something particular, you won't need this because it is a lot simpler to let Ultimate Terrains write data in the appropriate default folder (which is Assets/StreamingAssets/uTerrainsData/<terrain-data-path>/operations). See Data Path in Global Settings for more information. This method should only be called at edit time (ie. not at runtime) because it writes files in the StreamingAssets folder by default, which is not writable at runtime. The prefered way to persist data at runtime is the PersistModifiedRegions method of UltimateOperationsManager. It will automatically save all regions that have been modified since last save. Once the method returns, you can be sure modifications have been saved to disk in the directory at RuntimeDataPath. This method is not suitable for realtime saving as it may be too slow. The prefered way to persist data in realtime (ie. when the player is actually playing) is the PersistModifiedRegionsAsync method of UltimateOperationsManager. It is the same as PersistModifiedRegions except all processing will be done asynchronously in a background thread, so it won't make your game lag. However, you cannot be sure of when saving is done, so it is always a good idea to call PersistModifiedRegions before the game exits. You can implement your own way to save and load Operations if you think the other methods don't fit your needs. You can just serialize operations and write them to the disk as you wish. To load operations, you'll have to read your files, deserialize it, and then add operations back to the terrain with terrain.OperationsManager.Add(operation). If you implement your own loader, you will have to load needed operations before the terrain gets generated. Each time a player performs an operation, serialize it. Send it to all other players through the network. On each player that receive the serialized operation, deserialize it and perform it locally. network.SendToAllOtherPlayers(serializedOperation); // <- this is YOUR code. Ultimate Terrains does NOT handle network for you. To handle persistent worlds, you will have to persist operations by yourself on your servers (probably in some database). This part is not covered in this documentation. You will also have to load operations from the server before terrain is generated. You can do this by implementing a BeforeLoadEventHandler and registering it with terrain.OnBeforeLoad += yourHandler; in an Awake() method. List<IOperation> operations = GetOperationsFromServer(); // <- this is YOUR code. Ultimate Terrains does NOT handle network for you. Before using it, edit the file ReliefTerrainPMTriplanarStandalone.shader in ReliefPack/Shaders/ReliefTerrain/VertexControl in a text editor and comment the line #define LOCAL_SPACE_UV and the line #define WNORMAL_COVERAGE_X_Z_Ypos_Yneg (add "//" at the beginning of the line). Save it. The shader is now ready to be used with uTerrains. If needed, adjust the vertex color of your voxel types and you're done with RTP integration.